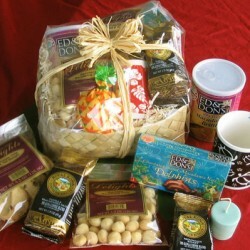 Categories: Bath, Spa and Fragrances, Hawaiian Gift Baskets, Hawaiian Gifts and Gift Baskets. 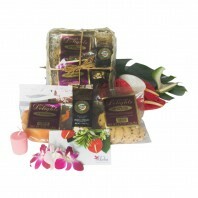 A Hawaiian gift basket designed to soothe and relax with a special formula. That forumla includes wild flower essences of yellow ginger, lehua and kinehe. All are scented with lemongrass and vanilla. The skin lotion also contains vitamins and oils to nourish the skin. 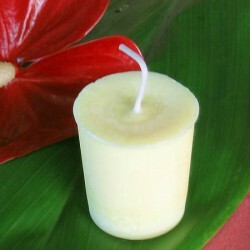 The fragrance is mild and relaxing; never overpowering. 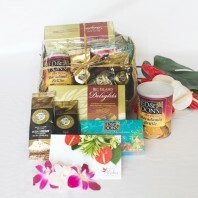 This stress release formula gift basket contains traditional Hawaiian elements to release the stress of the day. There is a bar of soap for cleaning and freshening. The soap is made with glycerin, not harsh chemicals. The lotion can be used on the face or anywhere to relax and moisturize. And the packet of bath crystals makes for a special and rejuvenating bath. One packet makes one bath or use part of a package for a stress relieving foot bath. 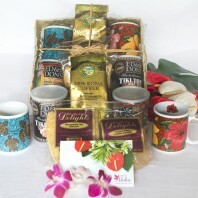 This Hawaiian gift is suitable for men or for women. 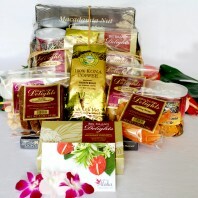 All of the items in our stress release formula gift basket are natural and made with special care. 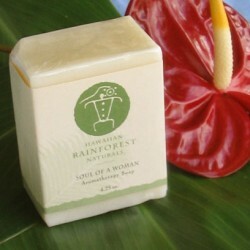 The formulations were created by a family on the Big Island. 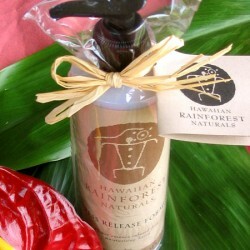 The plant essences used have been employed by native Hawaiians for years. 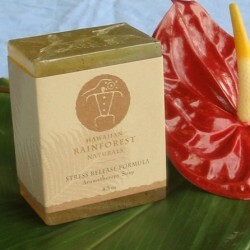 The essences are traditionally applied to reduce stress and increase relaxation. Each essence is carefully extracted from native plants. They are then infused into the base ingredients for making lotion, soap and bath crystals. Creatively arranged in a hand woven dried lauhala basket wrapped in cello and tied with decorative raffia. Or well place everything in a Hawaiian gift bag with tissue.